Hektor’s life of privilege is forever changed when a man, allegedly possessed by the sun god, inspires revolution among the oppressed townspeople of Wilusa – the historical Troy of myth. For Hektor, son of Bronze Age Wilusa’s despotic ruler, social equality contradicts every principle he has been indoctrinated into believing. But his principles and obsession with duty is alienating him from his young son, Hapi, with whom he has a fractured relationship. 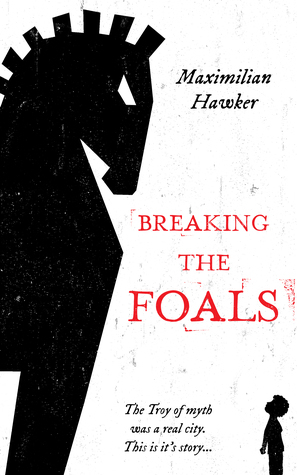 When the ‘possessed’ man saves Hapi’s life, Hektor is compelled to question the foundations upon which his father has constructed his life as he rebuilds his relationship with his child through the breaking of a foal. Wilusa collapses into political violence as the commoners rise up, and Hektor must decide whether to defend the people, but lose his identity, or remain loyal to an irrational, dangerous father. I was drawn in the cover and title. When I read the summary, I was extremely intrigued to read this. The story follows Hektor who has lived a life of privilege in the city of Troy. His father is an irrational and dangerous man who has made life for the common folk really hard. Things happen and Hektor must decide what side he is on. All the while he is trying to do right by his son Hapi. This was a really interesting tale for sure. It was a people story but mixed with the intrigue and violence of the time. I really liked the blend. It was so interesting to see the fabled Hektor in this light. Very different then from the Hektor we all know from the epic poem. I liked him there (ya...I was the one rooting for Troy ;D) and I liked him here too. This version was a more realistic version. There were some parts I scratched my head at like some word choices, but they didn't bug me overmuch. It's hard to be 100% accurate for historical books (trust me...I know - been there) especially when it comes to some slang words that are sooooo commonplace now. Also, I really wished this had been longer. I felt there was so much more that could've been added! I would've liked to see more in the epilogue. Maybe there be another book? I want to see what happens next! That ending. Sighs. So sad! Can't say much without spoilers, but oooo the feels. I did love the added bits with the son and the horse. It oddly worked so well and I'm sure there is some symbolism there if one is to really think about it. Overall, I did like this book. It was interesting and the ending did get me there. I do wish this had been longer. I feel like there is so much more story to tell! Also, a few little hiccups along the way, but all-in-all a good read especially if you're looking for something different. I'll stamp this with 3 stars. I've not heard of this book but I like the sound of Hektor in a different light. And again, Troy shall stand! Very interesting premise. Glad you enjoyed!